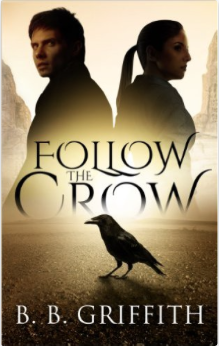 ​Follow the Crow is mystical and funny and exciting and--well, just perfect in every way. B.B. Griffith has done an amazing job of creating characters the reader can identify with and I love his method of telling the story from the first person point of view of three of them in alternating chapters. I'm also impressed with the amount of research he did, both on the Navajo ceremonies and on the medical details. While some of the things that happen in the book are certainly sad, the overall feeling I got from it was one of peace--that there is something more than just our plane of existence. I was so glad this is the first book in a series, because I didn't want to give up the world of the book just yet. And I really don't want to give up the red crow!